Introducing the new Heine Laryngoscope Handles with LED Light Source. These LED Handles offer illumination that is 3X brighter than a 3.5V halogen bulb. LED illumination also allows for significantly longer usage time. Plus, the LED Light Source has a lifespan of 50,000 hours and comes with a 5 year warranty. 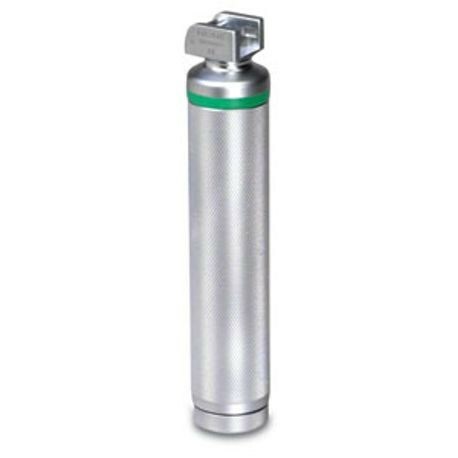 Heine Handles with LED Light Source are not approved for Sterrad® Sterilizers. The Status Indicator Cap allows the user to see a more specific charge status anytime. When you turn your handle on or remove it from the charger, the LED Indicator on the bottom of the cap lights up for 10 seconds displaying how much battery time remains. The Indicator Cap also remains lit at any time a laryngoscope blade is attached to the handle. The Status Indicator Cap comes with the 8721LED Handle. A Status Indicator Cap can also be added to any Heine Adult Lithium Ion LED or 3.5V Lithium Ion Halogen Handle (contact Customer Service for details). The NT 300 Charger offers an easy-to-see visual indicator on your handles charging status. The entire collar of the NT 300 is brightly illuminated. When you place your handle into the well to be charged, the light ring will pulse, indicating that your handle is being charged. Once your handle is fully charged, the light rings stay brightly lit for 4 hours indicating the full charge. After this, the lights dim low but stay constant still indicating full charge. During this mode, the charger ceases charging the handle. This avoids overcharging of the battery and helps to guarantee extended battery life. The NT 300 is the only charger that gives you this immediate visual clue as to where your handles stand in the charging process. 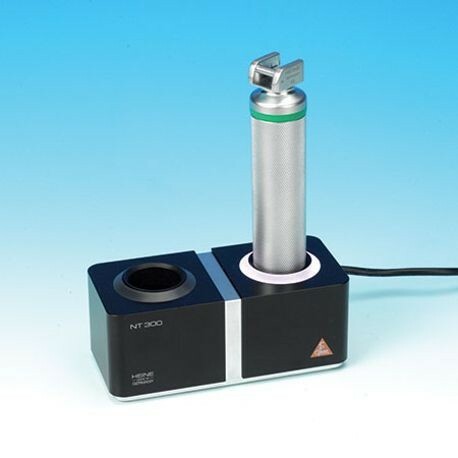 The NT 300 fully charges a handle with a dead battery in a maximum of 4 hours and is compatible with all Heine rechargeable laryngoscope handles.